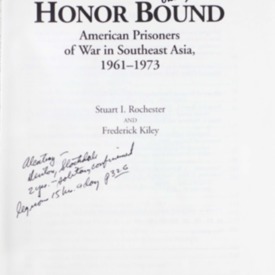 Honor bound : American prisoners of war in Southeast Asia, 1961-1973 · One Book. One Author. One Hour. 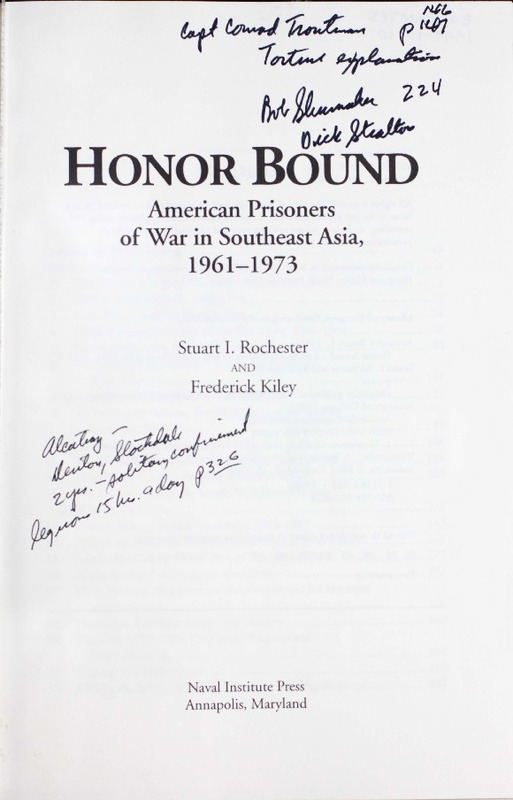 Rochester, Stuart I, “Honor bound : American prisoners of war in Southeast Asia, 1961-1973,” One Book. One Author. One Hour., accessed April 19, 2019, http://booknotes.gmu.edu/items/show/453. With this book, two respected scholars in the field offer a comprehensive, balanced, and authoritative account of what happened to the nearly eight hundred Americans captured in Southeast Asia. The authors were granted unprecedented access to previously unreleased materials and interviewed more than one hundred former POWs, enabling them to meticulously reconstruct the captivity record as well as produce an evocative narrative of a once sketchy and misunderstood yet key chapter of the war. "Giving due praise but never shirking from criticism, the authors describe in detail dozens of cases of individual courage and resistance, from celebrated heroes like Jim Stockdale, Robinson Risner, Jeremiah Denton, Bud Day, and Nick Rowe to lesser-known legends like Ray Schrump and Medal of Honor recipient Donald Cook." --BOOK JACKET. Notes on front endpapers refer to American prisoners of war held in Laos and South and North Vietnam, their eventual release in 1973, and their accounts of their ordeals in captivity. Also included is a list of names of some of the prisoners, their nicknames, and a list of prison camps with the names they were given by the prisoners. Other notes refer to the Hanoi March in July 1966, the subsequent decision by North Vietnam not to prosecute the Americans as criminals, an East German 1967 propaganda documentary which was shown in an abbreviated version in the U.S. under the title 'Pilots in Pajamas', the high level of education of American POWs in the North, attempts at escape from the prison camps, the particularly vicious prison named 'Briarpatch', instances of torture, and the covert communication devised by POWs by tapping on the walls of their cells. The following questions are included in the notes: "Where do you disagree with John Hubbell?" -- "What is the Code of Conduct?" -- "What happened when anti-war activists visited?" -- "What happened during bombing pauses?" -- "Were any POWs prosecuted for [the] violation of [the] Code of Conduct?" -- "What was Hanoi March Terror? Did it succeed?" -- "How many books have been written by POWs?" -- "What's rope torture?" -- Annotations by Brian Lamb in the margins and underlining of pertinent phrases throughout the book. "Vietnam War, 1961-1975--Prisoners and prisons, North Vietnamese."